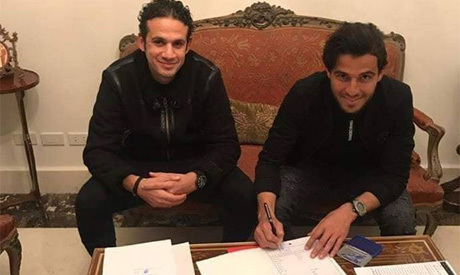 Ahly have signed Enppi midfielder Hamdy Fathi on a four-and-a-half-year contract starting this month, the Cairo giants announced on their website on Sunday. The 25-year-old Fathi joined the Reds in a deal estimated at EGP 30 million. The player was recently under the spotlight by Ahly after his outstanding performances with Enppi; as he netted three goals and provided two assists in 16 league appearances so far. Ahly have been very active during this winter transfer window in an attempt to inject new blood into the squad after the humble start of the domestic league this season. A series of negotiations between the two clubs were held before reaching a final agreement. Fathi is Ahly's seventh January signing following the arrival of Huddersfield winger Ramadan Sobhi (on loan), Maqassa left-back Mahmoud Wahid, Wadi Degla midfielder Mohamed Mahmoud, Angolan winger Geraldo, Al-Ain’s winger Hussein El-Shahat and Smouha defender Yasser Ibrahim. Ahly currently sit third in the league standings with 27 points, 14 behind table-toppers Zamalek, who have played two more games. At the continental level, Ahly opened their African Champions League group stage campaign with a 2-0 win over DR Congo's Vita Club on Saturday.